Board your flight from your respective hub and arrive in Port Blair. Our representative will meet you and transfer you to your hotel. In the evening, visit to Cellular Jail & Corbyns Cove Beach – a serene beach set in picturesque backgrounds of lush green coconut palms and pleasant sea. Later, witness the Light and Sound show at Cellular Jail the saga of countless martyrs of the Indian independence struggle who laid down their lives. The show, conducted in the premises of Cellular Jail, gives us a brief idea about the happenings in the jail prior to Independence. Return to the hotel in the evening. Early morning, departure by ferry to Havelock Island. Enjoy your afternoon at Beach number 7 on the western coast, better known as The Radha Nagar Beach. It is one of the most popular beaches on Havelock and was named Best Beach in Asia by time in 2004. overnight stay at Hotel at Havelock. After Breakfast trip to we proceed for a visit to Elephant beach. Elephant Beach is a small pristine beach, rather remotely located, it can be reached by boat. The beach is also an extremely good place for Snorkeling with an easily accessible house reef, which boasts of beautiful corals and other marine life. The beach has also emerged as Havelocks favorite spot for scuba diving. 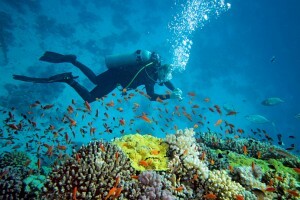 It is tailor made to be a beginners dive site. One can just walk straight from the beach and on to the spot where divers practice. return to Port Blair.overnight stay at Hotel at Port Blair. Note: Activity on direct payment basis. Jolly Bouy/Redskin located at a distance of 1hour of boat journey from Wandoor beach jetty (20km from airport) is ranked as the best Island in Andaman. The Island is unhabituated and has the cleanest beach and water in entire India. This Island is famous for snorkeling, swimming and the privacy it offers. Boat journey though creeks acts like topping on the cake. Note: – Subject to hotel availability at the time of Booking in case of non availability, similar category hotels will be provided. Accommodation on double sharing room (05Night Accommodation). Meals: Daily Breakfast & Dinner only (MAP). Port Blair to Havelock Transfer by Makruzz/Green Ocean Ferry- kindly note if private ferry is not operational or unavailable of seat then Passengers will be proceeded by Govt Ferry. 01 Session snorkeling complementary in Elephanta Beach with Ferry ticket, which is given by ferry, if any dispute discuss with ferry Master. Leisure day means which day we are not charging anything except hotel, on that day if you want to do any activity that will be chargeable as per your activity. If the CLD is in other hotel from the staying hotel then there will be Extra charge for Transfer/Cab. The package once booked is refundable and cancellable. Check-in at hotel starts from 9:00 hrs. Check-out time is until 8:00 hrs. Early check-in or late check-out is subject to availability and may be chargeable by the hotel. Once your payment has been processed, we will send you an email confirmation.